I look forward to this survey every year, as it’s yet another chance to book push all my favorites on you guys. You might notice that there’s LOT of repetition in my answers this year, but it’s only because I truly love these books and hope more people will read them. Or maybe it’s because I’ve forgotten 80% of the books I’ve read and these are the only ones whose titles I still remember. ? Number of books you read? 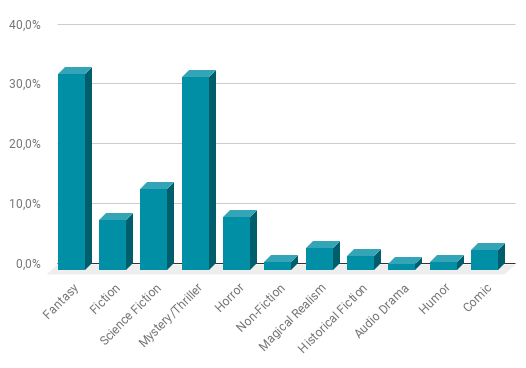 Genre you read the most in 2017? With rereads: Fantasy edged out mystery/thrillers by a single book! Worst book you read in 2017? Number of buddy reads in 2017? Best buddy read of 2017? Worst buddy read of 2017? Most read book of 2017? Number of series started in 2017? Number of series finished/DNF’d in 2017? Most surprising (in a good way or bad way) book you read in 2017? The Wolf Road – I was close to DNF’ing it but ended up loving it! Eliza and Her Monsters was surprising in a bad way, since I loved it up to 80% and ended up rating it two stars. 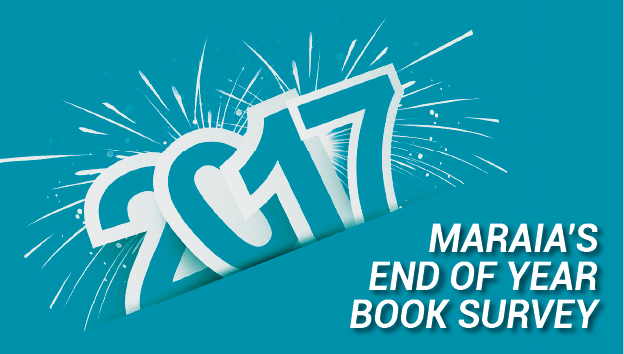 Book you “pushed” the most people to read in 2017? Best series you started in 2017? Best sequel of 2017? Best series you ended in 2017? Shortest & longest books in 2017? Shortest & longest audiobooks in 2017? OTP of the year (you will go down with this ship!)? Favorite book you read in 2017 from a new-to-you author? Best book you read in 2015 that you read based SOLELY on a recommendation from somebody else/peer pressure? Book that made you the maddest (doesn’t necessarily mean you didn’t like it)? One book you didn’t get to in 2017 but will be your number one priority in 2018? 2018 debut you are most anticipating? Sebastian! We buddy read 65 books, and most of them we got to read together on the couch, which is pretty much the best thing ever. Best bookish event that you participated in? Best moment of bookish life? Starting the Hobb Squad Instagram account with my friends Steph, Shari, Alyssa, and Jess. We’ve gotten to interact with Robin Hobb, host a hugely successful giveaway, and were even sent Robin Hobb’s novella by her publisher. Favorite Bookstagram account you discovered in 2017? Did you complete any reading challenges or goals that you set for yourself at the beginning of the year? I met my reading goal, which I really wasn’t sure would happen after the move! Sadly, I was two away from finishing the Popsugar challenge. A 2018 release you’ve already read & recommend to everyone? A Thousand Perfect Notes by my friend Cait. I think everyone should read it! Did we share any favorites? Which hidden gems did I miss? AWWW I’M BLUSHING. I FEEL SO APPRECIATED. ? And mildly terrified holy heck how do I have a book coming out this year I need to hide. ? Anyway I really love stats and recap posts so this was amazing (and yay you got the pie chart working!) 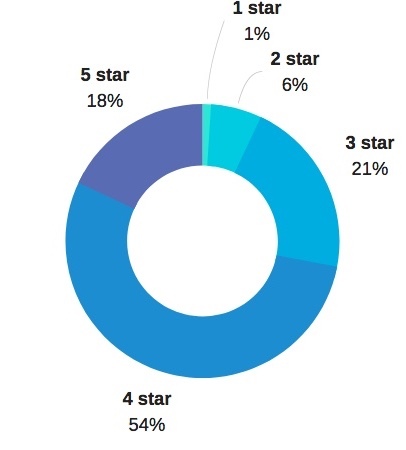 and also having 54% being 4 stars is pretty amazing. And you read ACOL 4 times?!? I am in awe of your rereading. I read The Gentleman’s Guide twice last year and that’s a first ever for me. Also holy heck how is IT so long. Who even has that many words of a story to tell.? So much love for Starfish. <3 And Strange truly has one of the most gorgeous covers and writing. And ahhhhh I'm excited for Summer of Salt too!! Sorry this comment is so rambly but I just want to mention all the things.? I had a re(realization) yesterday that it’s 2018, which means your book is really a thing. I can hardly process it, so I have no idea what your brain must be going through. ? Stephen King has way too many words and could stand to lose a few. ? I’m still so sad I didn’t actually enjoy Strange the Dreamer! I haven’t read much of what you’ve listed… although I did read TLWTASAP and I loved it so much!! All the characters were fantastic!! I read my first Laini T last year with Daughter of Smoke and Bone and once I finish that series I’m going to try Strange!! I hear such good things about it!! Happy New Year… hope you have another great year of reads! ? Haha, I may need some new hobbies. ? Have you read the sequel to TLWTASAP yet? I missed all the characters from the first book, but I’m hopeful that they’ll make a reappearance in the third. Ohh, I love Daughter of Smoke and Bone! The novella is worth reading as well. I didn’t like Strange the Dreamer very much, sadly. Thanks for commenting, Liz! ? Yay, solo-post. These are impressive stats! 🙂 I’m glad to see Robert Jackson Bennett getting a mention, and of course Robin Hobb and her Assassin’s Fate. Hehe 🙂 Yes, I had to slip Robert Jackson Bennett in somewhere! I read so many books that he never quite makes my top favorites, but I still love his books and want more people to read them. I can’t wait to see what he writes next. Oh this was so fun to read, Maraia! I find it interesting that a lot of the books you read aren’t on your instagram account… I guess because you read them as ebooks? That always happens with ebooks. Also, do you and Sebastian read at the same pace? I guess otherwise it would be really annoying (but that’s super cute that you buddy read so much together) Do his tastes chafe what you read, or vice versa? Also, why deer you disappointed by Strange the Dreamer?? You are rapidly convincing me that I really need to try Robin Hobb. Fantasy isn’t my favourite genre, but I do like well-written fantasy so yes. I don’t think I read any book more than twice in 2017, so you must have really loved ACOL 😀 One more question: Did you used to have your own book blog? Because it seems like you might have, i don’t know. Great roundup! Audiobooks! I live for them. Which book did you reread? Yeah, I’m shocked about the 203 as well. I really didn’t think I’d read much once I moved! But being able to read together actually encourages us to read. I’m still reading less in the end, but Sebastian is reading more. It doesn’t feel like we’re not spending time together if we read together. ? That’s a huge difference. oO I hope you’ll get through lots of books while nursing! And we really need to buddy read again! I think you’ve mentioned it, yeah. LOL, I hope whatever you reread this year will be more worthwhile. I feel like some people manage to take time for themselves, read, blog, etc., and some people are all baby, all the time. I loved reading this, and seeing all your stats! I’m very excited to track my reading stats this year. I really hope you enjoy Before the Devil Breaks You! Thanks, Steph! And for commenting. ? Did you use Crini’s spreadsheet last year, or is this the first year you’re keeping track of everything? Yes!! And we have so many amazing books, chats, and experiences ahead of us. ? Thanks! I’m sure I will. ? I had a pretty good reading year. I read 240 books, which is the most ever! Like you I LOVED Strange the Dreamer. I also have Starfish from the library at the moment and I“m looking forward to reading it. I loved Dramaticaly Ever After and Untidy Towns which sadly aren’t published outside their own countries but worked really well for me nonetheless. Wow!! That’s amazing. Have you started Starfish yet? I really hope you love it. It’s so painful, though. I haven’t heard of either of those books! It’s frustrating when your favorite books are available to such a limited audience. 43 rereads? How does one even? That’s amazing. I’m in awe. I must complete the trio and read Starfish so I can be crushed by all three of the books you listed. Happy 2018! Most of them were audiobooks! They make rereading so much easier. Yes, please read Starfish!! Oh you read and reread so many books Maraia! Haha I can’t believe you already read A Conjuring of Light 4 times. That is dedication. 😀 Starfish has such an insanely gorgeous cover. Haha, I love rereading! And audiobooks are the perfect way. Are you thinking about reading Starfish? It really is an amazing book. HOLY CRAP. I got sidetracked at the beginning: „Number of books you read? 203.“ You go girl!! Hahaha, thanks! Maybe I should have more of a life outside of books. ? I really need to read some Hobb, but I can’t remember which book you said to start with?! I REALLY need to read Strange the Dreamer, since I love Laini! I’m excited for Cait’s book – we’ve discussed that she’s very thoughtfully bringing it out a week before my birthday so I have time to get someone to get it for me! Haha! I love that you’ve read ACOL 4 times – I’m currently reading it and I already get why you would! Assassin’s Apprentice, book one of the Farseer trilogy. ? Yes yes yes to all of those. Starfish nearly killed me, please read it. ? I hope you like Stranger the Dreamer more than I did, lol. Gaah, I want to order copies of Cait’s book for everyone I know, but $$$$ I can’t wait to see what you think of it! I can’t even imagine how nerve-wracking it must be to have a debut novel coming out. Eeep, enjoy! I need to read your post about it. 203? OMG, you’re insane xD I just realized that I really, really need to read a Hobb book this year. I’ve been meaning to for months and it escapes me now why I didn’t put it on my to-read-in-2018-list. Haha, or I just don’t have any friends here. ? Eep, I hope you can still fit one (or more) in! Lullby to a lost world was also my shortest!! what a gorgeous cover. I love the way you did this survey! The second was my favorite, but the third book is still amazing. I hope you get to read it soon! Thanks, Lucille! I asked Sebastian to add some pictures for me to make it less boring. ?